Starting today, I am kicking off my first 100 days of fall blogging. I’ve just finished the summer of swim parenting. We’ve driven over 3000 miles crisscrossing the southwest to attend three out-of-town meets in the past three months. Couple that with three more in-town meets, thirteen practices per week, and other non-swimming activities and it’s been difficult to focus on much else. But the swim season has ended. The kids are back in school. And I’m ready to ramp up my blogging activity. The expression first became popular with President Franklin D. Roosevelt. President Roosevelt wanted to use his first few days in office to begin pulling the country out of the Great Depression. As Roosevelt took office, the country was in turmoil with the stock market having lost 85% of its value, a quarter of the workforce unemployed, and the banking system teetering on failure due to cash hoarding. During his first week in office, Roosevelt jumped in with both feet, making changes to secure the banking system and laying the groundwork for what would become his “New Deal.” By the middle of 1933, the term, “first 100 days” would be forever linked with the beginning of the Roosevelt presidency and would thereafter be used to measure the effectiveness of all future Presidents to follow. 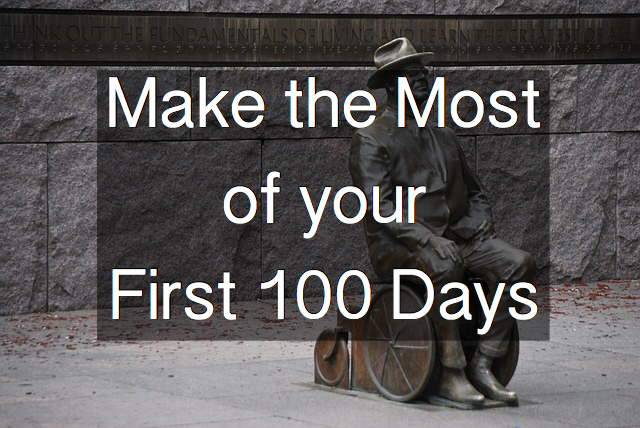 What Will You Do in Your First 100 Days? But no matter what your endeavor, the first 100 days are critical. This period represents not just a time of learning, but also a chance to set your tone for the future. It is during this time that expectations are often low giving you the opportunity to shine and possibly catch others off guard. And while having detailed specific plans isn’t always necessary, I do want to know that the candidate has thought about what life will be like working in the role. I hire people who are self-motivated, forward-thinking, and well-prepared. How they answer the question about their first 100 days tells me much about how they will perform in the job. For most new hires, I am looking for a response that addresses the three aspects of any role that you need to master – people, technical, and culture. People. Companies are run by people. To get anything done, you need to know who to go to. Learning who does what and building relationships with people is critical to your success. Depending on your role, the people you need to know include supervisors and above, subordinates and below, and most importantly, your peers. Unless you’re the CEO, you will have peers. Technical. This refers to the skills needed to succeed at your job. Technical attributes can include programming, analytical skills, sales ability, or many others. When you start a new role, you may already have a solid foundation in the technical aspects of the job. As you move up, this will become more of a hiring requirement. But just having the technical skills doesn’t mean you are ready. You will need to apply those skills to your new company and new position. Culture. This aspect of you new job will be a significant determinant of your satisfaction in your new role. Culture spans both the entire organization and your specific area within the company. If the culture in either area is misaligned with your own goals, you will struggle to feel comfortable. I like to find opportunities to create little motivational incentives. Setting up a number of goals for the first 100 days of fall blogging does just that. Plus, I do better with checklists. When I organize everything into a nice, neat spreadsheet, I know what I need to get done and I can track how successful I am completing those items. Post 4 articles per week. This will be a monumental task. I’ve struggled with consistency in posting and this drives me crazy. I generally write when I’m inspired without much regard for sticking to an editorial calendar. This creates periods of writer’s block. I have also noticed that the more often I write, the easier it becomes. When I go for longer stretches (as in the period between this post and the prior one), it becomes more difficult to get the words out. A concern about writing and posting daily is keeping up the quality. In general, I’ve been able to maintain a pretty high quality standard up to this point, and I don’t want that to change. I am going to use the next 100 days as a test period to determine if I can post more frequently and maintain the high quality. Respond to comments within 24 hours. I am so appreciative when readers not only take the time to visit the site and read the articles, but when they go through the effort of leaving a comment as well. Comments are motivating. They help you realize that the page view stats you see are real people (at least some of them). I love the interaction and commit to respond to comments within 24 hours. Visit and actively participate on 10 sites per week. This actually seems too low. There are so many great sites, the harder part is not spending all your time reading articles online. But by setting a specific target, I can measure my success in achieving that target. And there’s nothing to say that I can’t exceed the target. It’s smart to set reasonable expectations and then try to beat them. Take off Saturday or Sunday. We all need time away. After the latest swim meet, my family rented a house in the mountains for a few days before returning back home. It was truly remarkable. Nestled on a steep slope facing the ski area, we spent many hours sitting outside enjoying the scenery and each other’s company. I am a big believer in being proactive. And that means scheduling time away from the site. As I am a solo operation at the moment, it’s difficult to get away for more than a day (and still respond to comments within 24 hours), but I can (and need to) get away for at least one day per week. You may notice that all of the above goals are things that I can control. As I’ve mentioned before, focus on the inputs and let the outputs take care of themselves. Readers, thanks for hanging in there with me over the summer of swim parenting. Please let me know what you think about my goals for the first 100 days of fall blogging. And share your goals for the next 100 days (or whatever time frame you prefer). Great article, and good luck with the 4 articles posted per week. I would be interested to know whether you site down each day to write, or do you do several posts and simply schedule their publication? For myself, I need to set aside time, each day, or it is a scramble to get something out. Is the referenced “site participation” generally a personal commentary on someone else’s blog post, or do you contribute guest articles etc.? I am referring to reading and commenting on other sites. As far as writing, I tend to work on one post at a time. While I have many drafts and ideas written down, typically I don’t pull it into final form until the day it gets posted. Going forward, my goal is to write nearly every day. As I said, I find the writng process works better the more iften I write. I think you’ve set some great goals. I totally get the swim parenting – (and I was a swimmer too!) I’m not sure I could manage four posts a week at all. I have to work hard to get two done. I do the same thing you do in terms of writing though – I have a bunch of ideas, but I find it really hard to write more than one post at a time. Good luck and look forward to your progress! I too have struggled to even write two posts per week. But by targeting a higher output, I am hoping to get a little extra kick in the form of developing a good habit of daily writing. FS, I commend you on your ambitious yet achievable goals. They’re clear, concise and numerical – making it very easy to know if you can do it or not. 4 posts a week is quite a tall order, as you’ll have to post on consecutive days to make them fit in some calendar weeks. Having a clear plan about what your topics will be about, will help a lot (otherwise you may run out of ideas). I am a little worried about running out of ideas. Recently, I’ve been spending more time just brainstorming and writing down ideas and drafts. I haven’t figured out exactly how to structure the four posts per week, but that will come with time. I do have a few thoughts that will keep the content ideas flowing. Over the past two months or so, I have also fallen off with my participation on other sites (and my own for that matter). I remember hearing from other bloggers who had been doing this a while that summer tended to be a slower time. And now I see why. It’s tough to find the time. But now that things are slowing down, I’m looking forward to getting back out there.